Shop Novation MiniNova Analog Modeling Synthesizer from AMS with 0% Interest Payment Plans and Free Shipping. 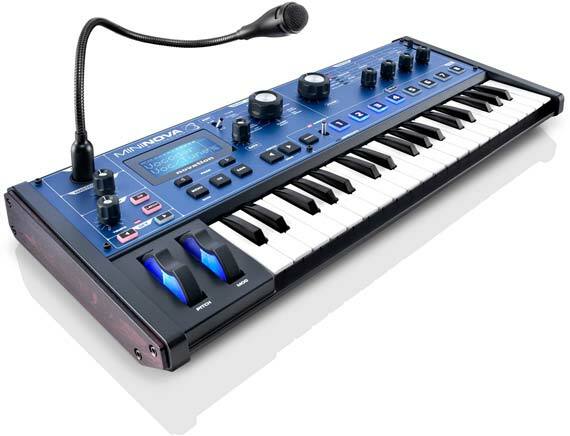 The Novation MiniNova 37 Key Compact Synthesizer is a powerful mini-keys synth with incredible performance controls, which enable you to tweak and warp the onboard sounds, and your own voice. Free Giorgio Moroder Sound Pack! MiniNova users are free to enjoy several supplemental Soundpacks, which are easily downloadable from Novation's website. In addition, MiniNova is bundled with 30 Giorgio Moroder-inspired patches, also free and downloadable upon product registration. It has the same synth-engine as its big brother - the UltraNova - and comes with 256 awesome sounds so you can get started straight away. If you want to dig deeper, it has a fully editable Nova-class synth engine (derived from the legendary Supernova series in the 1990s). MiniNova's compact size, massive sound and performance/editing controls make it perfect for producers, gigging musicians and anyone creating music with computers - it can also be a 37 key controller keyboard with MIDI I/O. The VocalTune and vocoder enable you to recreate classic vocal effects, as well as brand new voice-bending possibilities! MiniNova has 256 onboard sounds and space to save another 128 of your own sounds. You can quickly search for sounds by selecting the type of music you're making, or the type of sound you're after whether it's bass, lead - hip hop or techno. MiniNova comes with a free software Patch Librarian so you can store as many sounds as you want on your computer. If 256 is not enough, there are numerous soundpacks for MiniNova assembled by renowned artists and sound designers. These can be downloaded free from: novationmusic.com/soundpacks. MiniNova can do things other synths can't. It has knobs that allow you to tweak and edit the sounds, but it can also 'animate' sound with 8 back-lit buttons. These trigger 'mods' in the synth engine that can warp sound in incredible ways as you play. There is also a large knob for filter cutoff so you can get instant control of the filter whatever else you are doing. MiniNova has an arpeggiator; you can use the 8 buttons to jam with arpeggios creating totally new sequences in real-time. MiniNova takes vocal effects one-step further. As well as a vocoder, it has VocalTune. This means you can talk into the mic and play the tune you want your voice to follow on the keyboard recreating those classic Hip Hop / Urban vocal effects. You can also run your voice through MiniNova's effects engine, adding reverb, distortion, chorus/phase, gator compression or EQ. This doesn't need to be limited to your voice; there is an input which you can plug a guitar or any other instrument and give it the same treatment; effects or vocoder. MiniNova has an enormously powerful synth engine, unheard of in such a compact synth. There are 14 conventional waveforms to choose from (square, sine, sawtooth, pulse, triangle and combinations), 36 wavetables and 20 digital waveforms. Each of the 3 oscillators (per voice) have density/detune for fattening up sounds, virtual sync and 'hardness' - which acts as an additional low pass filter. There are 14 filter types (and you can run 2 simultaneously), 6 envelope generators, 3 LFOs and 20 modulation slots where you can link modules of the synth engine together to shape sound. MiniNova can add up to 5 effects to each voice including distortion, reverb, chorus/phase, delay, compressor, EQ and Novation's unique gator effect. Editing sounds in such a powerful synth can be overwhelming, so we've created a software application gives you visual access to the synth engine. The MiniNova Editor works as a plug-in within your DAW or music software. You can fully edit MiniNova using the hardware, the software just makes it more simple to see what you are doing. Easily one of the BEST synths to come out in the last decade. I've owned 3 of these beasts. They sound great, the editing software via the computer is solid and all around Novation really came back to form with the Nova series. I've owned 3 because I'm a performing musician and can be a little rough live with them. Generally I replace some of the side plate screws with guitar pegs and wear it a la keytar style and even though they weren't built for that.. it's fantastic. I also play in another group and use a second solely as a vocoder. Easy to fix, great sounding and inexpensive. Easily one of the BEST synths to come out in the last decade. Absolutely cool little synth. I am a guitarist that wanted a keyboard for demo’ing in my project studio. The sounds are really decent. The synth is relatively easy to figure out how to use. It’s also very compact but powerful. I am really glad I purchased it. Great keyboard. It does exactly what it says it does. Would love to have 8 (or more) extra buttons to save favorite sounds. I use this little thing in combination with electric guitar and drum synthesizers. I have small hands and the tiny keys are actually pretty fun to play when you get into a groove. I used to own the ultranova and I actually think this mininova has more charm. It’s also just so inexpensive and portable. It’s not for everyone, but for my needs it’s really useful. The vocoder in this thing is boss!! I tweaked a little now it sounds amazing!! Great product by Novation!! Amazing sounds and beautiful made. It has amazing sounds and I love that you can make quick hands on changes to the sounds, great for live performances. They say powerful sound engine...holy **** this thing ROCKS!!! I HIGHLY RECOMMEND THIS UNIT!